Be the first to share your favorite memory, photo or story of Ercel. This memorial page is dedicated for family, friends and future generations to celebrate the life of their loved one. 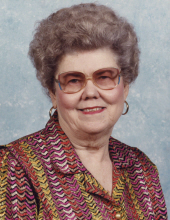 Ercel “Faye” Simpson, 92, of Rule, passed away Saturday, November 24, 2018 in Haskell. A Funeral Service will be held 11:00am, Tuesday, November 27, 2018 at the First Baptist Church of Rule with Rev. Russell Stanley officiating. Burial will follow in Rule Cemetery under the direction of Haskell Funeral Home, 2 Avenue D, Haskell, TX. A visitation will be held Tuesday from 10:00am – 11:00am at First Baptist Church. Condolences may be made at www.haskellfuneralhometx.com. Faye was born November 3, 1926 in Rule, Texas, the daughter of the late Ewell Benjamin Lusk and Effie Ann Grimsley Lusk. On April 21, 1945, she married Leslie Smith Simpson in Ft. Worth, Texas. She worked for Woods Pharmacy and as a sitter for the elderly. Faye sewed, making clothes for her daughter’s Barbies and made formals for events. While keeping her nieces and nephews, she liked to teach them how to drive. Faye loved to laugh and have fun. She was a member of Sweethome Baptist Church, and was a devoted friend, wife, mother, grandmother, aunt and great grandmother. She was preceded in death by her parents, husband Leslie Smith Simpson in 1971, daughter Linda Faye Simpson Harris in 2005, siblings, Carolyn Reynolds, Unita Odelberg and Shelton Lusk. Faye is survived by her daughter, Patti Ruth Simpson Wilson of Lueders, TX; grandsons, Lee Taylor Wilson of Haskell, TX; John David Harris of Abilene, TX; granddaughter, Elizabeth Jane Harris of Salt Lake City, UT; great granddaughters, Caroline Faye Cook and Emily Cook both of Salt Lake City, UT; son-in-law, Robert Harris of Salt Lake City, UT, nieces, Leisa Reynolds Hutchinson and husband Dieter, Jana Odelberg Mendez, Laurie Reynolds Gross and husband Tim, Tim Odelberg and wife Cathy, Mark Reynolds and wife Sage, extended family and a host of dear friends. To send flowers or a remembrance gift to the family of Ercel Faye Simpson, please visit our Tribute Store. "Email Address" would like to share the life celebration of Ercel Faye Simpson. Click on the "link" to go to share a favorite memory or leave a condolence message for the family.